It is true to say that serving healthy school meals by itself is no magic bullet. It the sum of the parts that make the difference and over the last few years a transformation has been underway in schools to improve children's knowledge, appreciation and consumption of good food. Great food is matched by a positive food culture in schools which includes having a whole school food policy, food education, cooking in school, growing food, 'grow, cook and eat', a welcoming dining environment, access to palatable drinking water and positive adult role models. Better access to good food at school means better health and improved life chances especially for poorer pupils. A school meal can often represent the only nutritious meal in a child's day. In Leicestershire our school food provision comes from Leicestershire Traded Services (LTS) who have won awards for the nutritious food they serve, find out more on the menus available. Children in years 2 and below are entitled to the national Universal Free Infant School Meals scheme, we can work with you in school alongside LTS to promote free school meals if you would require any support. See the step by step guide to developing a healthy packed lunch policy in school to encourage a consistent approach to healthy school lunches, both school and home provided. 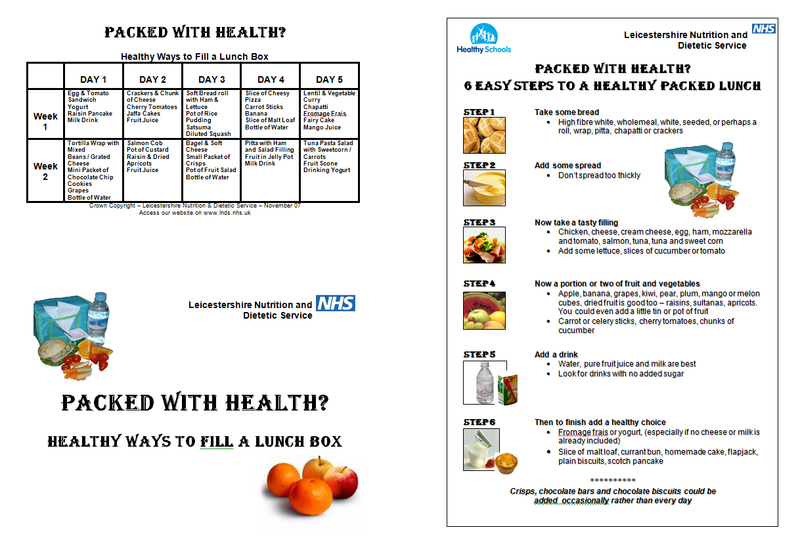 Our colleagues at Leicestershire Nutrition and Dietetic Service (LNDS) have created the below to provide inspiration for healthier lunchboxes.